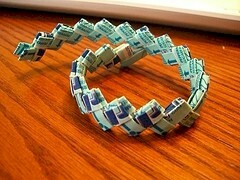 I used to make these all the time too and still remember how. I also enjoyed adding as many different wrappers as I could and even picked them up off the streets if I saw them. I know how to make the purse- send your email and I'll tell you how. You can delete your comment afterwards, I believe. I am making one with chip bags, cut up. So cool. I remember my Dad made me a purse out of gum wrappers. Don't know the weave technique he used- wish I did! He also made one out of all brands of cigarrette wrappers, including Lucky Strikes....bad..but really cool looking. I hear these can be made with candy wrappers as well. Would love to take this hobby up! The best way to do this is fold the gum wrapper in half long ways. Tear or cut that in half, then fold both pieces in half long ways again. now you have the 2 begining pieces. next fold one piece from one end to the center then the next end to the center. You have one piece already do the same with the next piece and put them together. that's all you have to do until the next piece of wrapper. and it helps if you find wrappers also so you don't always have to buy gum. Thanks for putting this in here. Funny, I tried to teach my grandchildren how to make these. I still remember how to do it. I Loved doing this when I was a kid. the longer the chain is how tall your husband will be.